420 руб. 195 шт. 2-3 недели 1 шт. 1 шт. 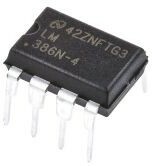 A range of single channel power amplifier ICs from Texas Instruments with power outputs from less than 1 watt to over 50 watts. These highly integrated devices incorporate many advanced features including thermal overload, short-circuit and safe operating area protection, muting facilities and wide operating voltage range.